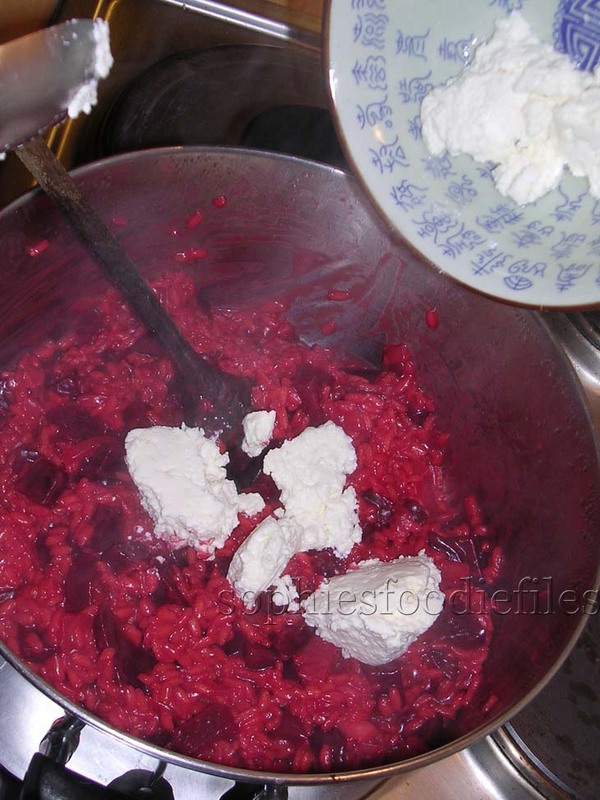 Vegetarian beetroot risotto with 2 cheeses! When you add the 2 cheeses to the risotto, after cooking, the risotto will turn pink red bubblegum color,..cool,..hey? This main course is a win-win at a lovely dinner party: success guaranteed!!! 🙂 Ooh yes! 1. Take a larger cooking pot & heat up on medium-high. When hot, pour 3 tablespoons of that fruity evoo in it & swirl it all around the pot. 2. Add chopped onion & garlic & fry for about 4-5 minutes. Now, add the rice & stir it all around the base of the pot for about 3 minutes or so. Add beet chunks & stir continuously! Add wine & stir non-stop. Gradually, add the hot stock & only pour in more stock until the rice has absorbed the stock & do this process again & again until al the hot stock has been used up. This will take about 15 to 25 minutes. Check the rice. It must still have a bite to it but must be cooked through, al dente. Take it off the heat. Your risotto still must be a bit liquid & moist too! Off the fire, add your 2 cheeses & stir it well through the risotto. This will bind the risotto more,…Check the seasoning again. Maybe you must add some grins of finely milled black pepper. 3. Serve at once with a loved one & drink the same wine like the one you have used in your risotto! 🙂 MMM,…& cheers! When you add the 2 cheeses to the risotto, after cooking, the risotto will turn pink red bubblegum color,..cool,..hey? 3. Serve at once with a loved one & drink the same wine like the one you have used in your risotto! 🙂 MMM,…& cheers! Stay tuned, Subscribe through the photo link below to get my new cool newsletters aka posts! Join 1,800 email Subscribers! It is free! Click onto this link below! A divine & tasty endresult! 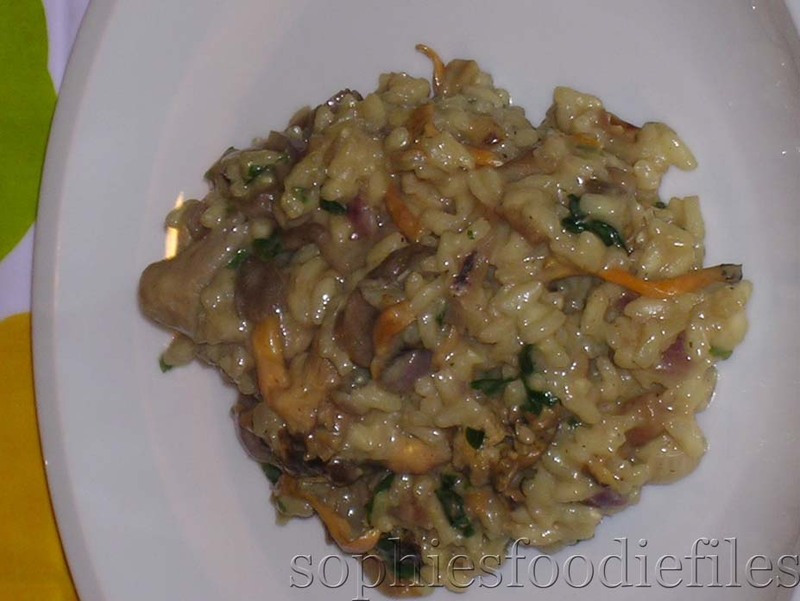 A few days ago, I made this fabulous tasty mixed mushrooms risotto. I bought fresh yellow cantherelles, oyster mushrooms & dried porcini’s. 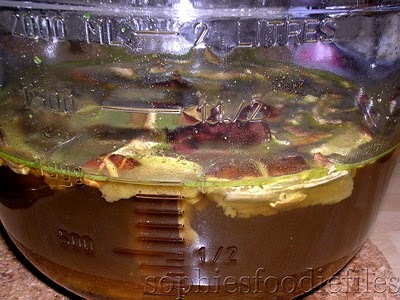 Dried porcini’s are marinated in a vegetable stock to soak up flavour & to swell up. This also creates a grand flavoured & rich vegetable stock! All of these types of mushrooms are in season & their flavours are wonderful. I made this risotto as an ode to their marvellous tastes! Soaking the dried porcini’s in the vegetable stock for more added flavour! 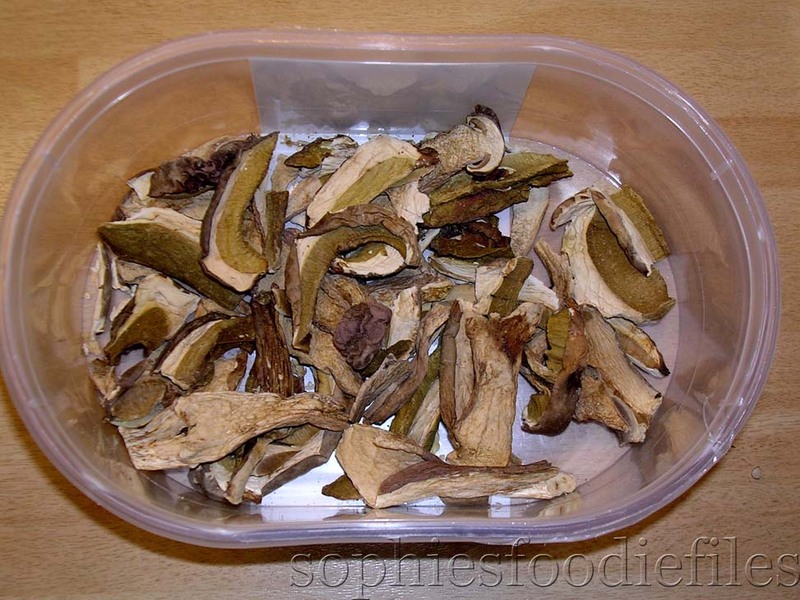 20 gr of dried porcini’s ( You can buy them in mushrooms shops in sachets ), see picture above! 1. Take a pot for the stock. Bring to the stock to the boil. When the stock is super hot, pour in a pot & add the dried pocini’s. Let them sit in there for about 15 minutes so that the mushrooms can soak up the aroma’s. They will swell too. The stock will be brown & dark now. 2. In a large cooking pot, add about 2 to 3 tablespoons of the fruity EVOO & let it heat up on medium heat. When hot, add the 1 of the cut up onions & about 2 pieces of cut up garlic. Fry for about 2 to 4 minutes. Stir frequently. Now, add the arborio rice & fry it for about 2 to 3 minutes. 3. Sieve the stock. Wrench the swollen porcini’s, so that most of the liquid is sqeezed out, save the juice from the porcini’s & pour it into the rest of the stock. Keep the stock warm. Cut the dried swollen porcini’s into pieces. Add them to the rice mix. Stir well. Fry for about 1 minute. 4. Now, add the wine. Stir well on medium heat & let the wine evaporate a bit. Add continuely, a bit of the stock to the risotto, stir all the time just about when the rice has absorbed the stock & then pour a bit of the rest of the stock,…etc just when the stock all has been used up. This will take about 20 to 25 minutes or until the rice has cooked. Stir frueqently & watch the rice very carefully. When ready, taste! It has to taste fab! Put the cooking pot off the fire but add a lid on top to keep hot. 5. On the same fire, heat a large non stick pan & add 2 to 3 tablespoons of the fruity EVOO on medium heat. Now, add the rest of the cut up onions & the rest of the garlic into the pan. Fry for about 2 to 4 minutes. 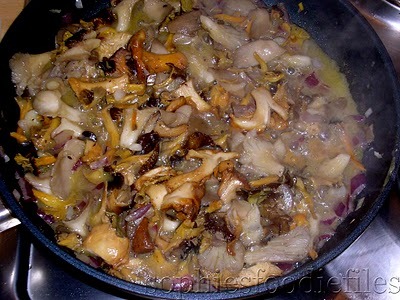 Add the cut up canterelles, the cut up oyster mushrooms & fry for about 3 to 5 minutes until they are cooked through. Add some sea salt, only a bit because the Parmesan cheese already will be salthy & fresh grinds of black pepper. Taste again! 6. Now, add the cut up Italian parsley & turn the heat off. Finally, add the onion, garlic & mushroom mix to the risotto pot & carefully mix everything. Taste again! It has to taste fab! Now, add off the heat, the grated Parsmesan & add 2 tablespoons of butter. Mix gently. Place a cooking lid on top & wait for about 2 to 3 minutes so that the flavours can soak in,… Enjoy with the same dry white wine in your wine glass! Cardamoms are the seed pods from a tall shrub native to India & Sri Lanka. To make sure, the pods stay whole, they are picked by hand which is why cardamoms are almost as expensive as saffron! Green Cardamom pods should be fat & green. It is best to buy whole cardamom pods. You can slice the pods open in 2 & use the seeds. I put them in a pestle & mortar to crush them finely & then use it in deserts. Each cardamom pod includes little, dark brown or black & sticky seeds. The stickiness is the hardest evidence of its freshness!!! In India, cardamom has been used for over more than 2000 years!! Cardamom pods keep well for a year in an airtight pot. But its taste & colour will deteriorate in time. Cardamom is used in Indian desserts like Kulfi, in tea, desserts, cakes, cookies, etc. It is also used in food like in Korma’s, massala’s, curry powders,etc. I buy them in 50 gr plastic bags in the Indian food shop. * For the brûlée topping: 50 gr of castor sugar / The finer the sugar, the better the topping will caramelise. 1. On a chopping board, split the 5 green Cardamom pods open in 2. Remove the husks & place the seeds in a pestle & mortar. Crush them finely into a powder. You will smell a lovely aroma!! 2. Take a medium cooking pot & heat up on medium. Place the butter into the pot & let it melt. 3. When melted & sizzling hot, add the crushed cardamom powder, fry for a few seconds & stir frequently. 4. Now, add the arborio rice & the sugar. Stir well. Fry for a few seconds more & than pour in the milk: all of it!! 5. Now, bring to the boil. Now, simmer for 15 minutes, stirring frequently because you do not want a skin to form onto the milk mixture!! !You will see that the mix will begin to thicken!! 6. After those 15 minutes, add the sultanas. Stir well & often. Fry for another 10 minutes. By then the risotto will me moist, the risotto will be creamy & the rice will be cooked. If not, fry & stir for another 5 minutes or so. Turn the heat off. 7. Spoon into little ramekins. In my case, I could fill 3,5 ramekins of 100 ml. Put cling film on top of each. 8. I put mine the fridge to use later. Keep in mind when you put them in the fridge to eat them later, that the risotto will stif up. So, when the risotto is moist & ready, off the heat, add a bit of milk to the pot & stir well. Then spoon the risotto into the ramekins. Use oven ramekins. 9. When you are ready to eat them, take out of the fridge. 10. Take your castor sugar. Divide evenly over the ramekins. 11. Take your Crème brûlée Brander. Grill the sugar. Grill until evenly browned & until it has formed a thick brown & golden sugar layer. If you do not have that, put it under the grill for a few minutes until the sugar has caramelised. Cool a little before serving. Enjoy!!! The risotto is creamy & so lovely!!! The cardamom is subtile & yummy!! Yesterday, I made this lovely vegetable risotto. It is a recipe from Rachel Allen. She is my favourite Irish cook & baker! I have several cookbooks of her! She rocks! 2. Take a medium cooking pot & fill with hot water. Bring to the boil. When boiling, add the frozen peas. Cook until al dente. In my case, that took 8 minutes. Drain. Keep warm. 3. Take a large cooking oven safe pot with lid, like Creuset, to use later in the oven. Heat up on high with 2 tablespoons of olive oil. Add the cooked peas & the spinach. Stir all the time for 1 to 2 minutes until the spinach has wilted. Season with black pepper & some sea salt. Add 50 ml of the vegetable stock. Stir. Now, purée or mix everything together in the blender or with a mixer. Taste. Season according to taste! It mustn’t taste bland! It must taste terrific! Set aside. 4. Heat the same Creuset pot up on medium heat. Add 2 tablespoons of olive oil. When the oil sizzles, add the chopped up garlic & onion dices. Season with pepper & sea salt. Cover with the lid & fry until the onion parts & garlic are softened but not coloured. 5. Add the rice & stir it around for 1 minute, then add the remaining vegetable stock & the white wine. Stir everything round. Now, turn the heat on high & bring to the boil. When boiling, turn the heat off. Put the lid on & place in the oven & bake for about 15 to 20 minutes until the rice the liquid has absorbed. 6. In the mean time, take a large cooking pot & fill with hot water. Bring to the boil. When boiling, add the green asparagus & cook until al dente. Drain. Keep warm. 7. When the risotto is cooked. In my case, it took 20 minutes, take the lid off with hand gloves!! Stir the purée in the risotto. Stir well. 8. Take your plates & plate up! 9. 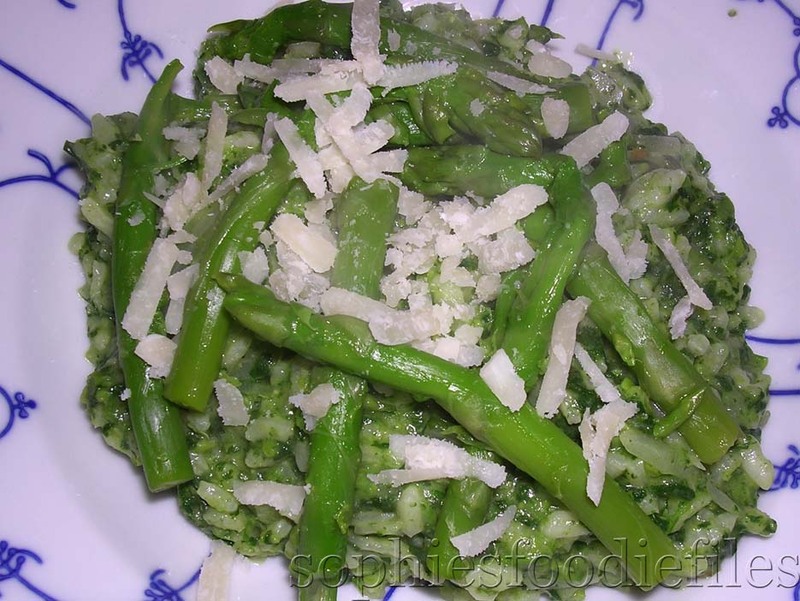 You have a lovely, easy & healthy risotto topped with green asparagus & Parmesan shavings on top! This is lovely enjoyed with the same wine you cooked with, white wine : Grand Bordeaux Sauvignon 2006! You directly want to dig in, hey? 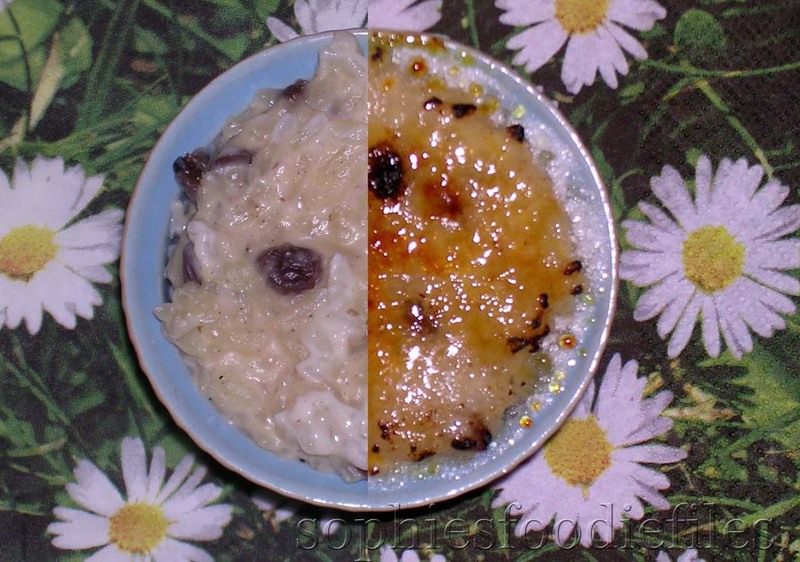 This is the most lovely rice pudding I have ever made. This is a recipe from Nigella Lawson. I slightly adapted it. Oh, this woman can cook! It is made with unsweetened cocoa, 1 sachet of vanilla sugar, sugar, Arborio rice & 1 litre of semi – skimmed milk. Then it is baked into the oven for 2 hours! It is utterly delicious! It is a bit sweet but not too sweet! 1. Preheat the oven to 150° C.
2. Take a large bowl & add the cocoa. Add 4 tablespoons of boiling water to the cacao to dissolve it. Stir well or whisk, whisk, whisk! 3. Now, gradually add the milk.Whisk! 4. After all the milk is whisked in, add the vanilla sugar & the sugar. Whisk well. 5. Now, add the rice. Whisk again. 6. Take a large oven dish & butter it. Pour carefully all the mix in. Whisk again & divide the mix in the dish if possible. 7. Cook or bake the dish for about 2 hours. In my case, it took 1 hour & 45 minutes. 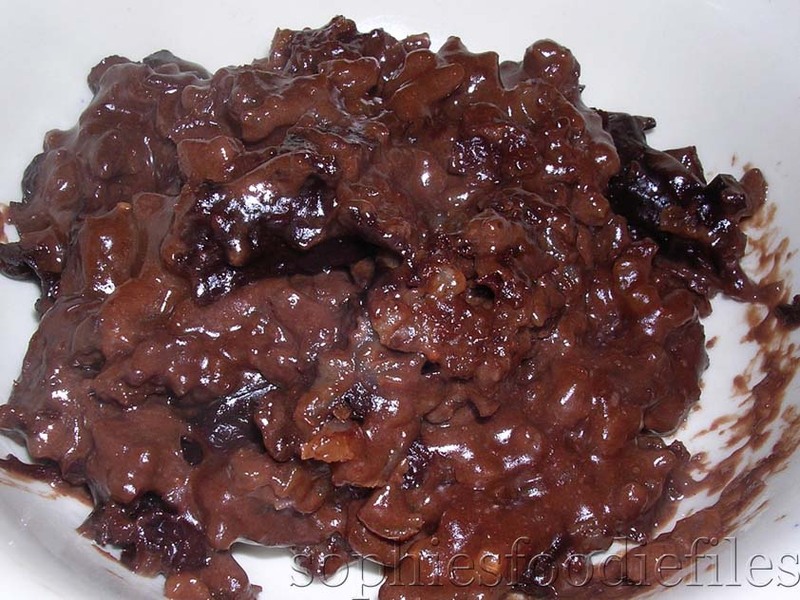 Every 15 to 20 minutes, you have to stir with a spoon into the mix otherwise the skin on top of the pudding will turn black. You have to prevent that! So stir with a spoon everything round; so that the skin will be mixed into the rice. Do this carefully because the mix will be very liquid in the beginning! I assure you that the mix will become more & more solid towards the end of the baking time! You have to wait for a very long time, but its worth the wait! 8. When ready, take it out of the oven & wait for 5 minutes. 9. Spoon into serving bowls & enjoy!